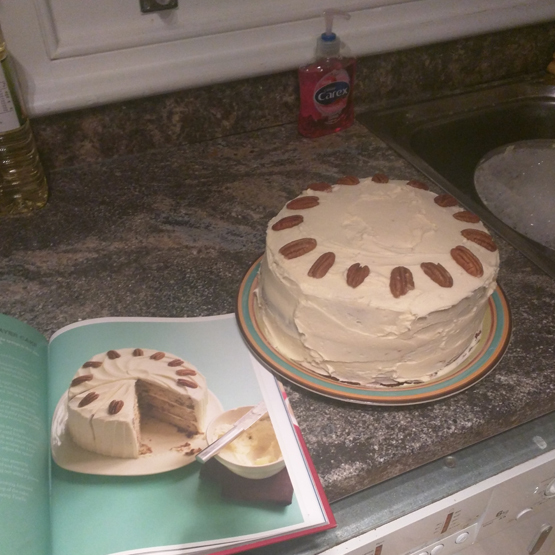 So if you want to make a cheap cake – slink away from this page, because nuts and maple syrup don’t come cheap. But if you have expensive taste and adore nuts and maple, then you’re going to love this cake. I think it’s probably my favourite cake of all time. This is based on a recipe from the Hummingbird Baker Cake Days book and is by far my favourite recipe book I have – and honestly, I pretty much have them all – it’s a problem. Also, if you ever are in London join the queue to pick up a cupcake or a slice of rainbow cake at one of the bakeries, they really are worth the cash. What I will say about Hummingbird recipes is that they aren’t subtle. They are for the kind of people who like their desserts super sweet, bright and slavered in butter icing. Which is me. I don’t understand people who eat dessert and say ‘It’s a bit too sweet for me’. I play a bit fast and loose with the recipe (I add more of the good stuff) – so will let you know when I deviate. Also, I think it’s really easy to make and has never gone wrong. I adore baking. There’s something about it which relaxes the mind (plus you get to eat cake afterwards), so thought I would share with you what I do on a ‘typical’ weekend – which also explains the size of my arse. Stick the ingredients into Mysupermarket and it will tell you where you can buy them cheapest. You’re also going to need three 8 inch loose-bottomed tins, or you’ll never get the cake out! Actually, you know what – if you have a normal sized oven, you can only put two in a time anyway, so just buy two and reuse one when the cakes are cooling. You’re going to need a good few hours because you have to let the cakes cool fully – plus there is three of them. So here’s me laying everything out (obligatory shot eh?!). I do like to make sure I have everything I need before I get going. That maple syrup if actually from Canada by the way! Had to dust the tin off – but its still good. You then need to mix the butter with all the dry ingredients in a bowl. The book recommends you use a mixer, but I don’t have one – so hand whisking it is! I personally like to start with softish butter and sugar (and try not to eat clumps of it – don’t judge!) and then add the rest once it has broken down a bit. It should look like you have a bowl of fine crumbs. You then stick all the wet ingredients in a jug (milk, eggs and maple syrup) and give it a mix. Slowly add it all to the dry ingredients and mix like your life depends on it. Chop up your nuts. I like them quite chunky personally, but do what you will. I also put extra in, because I can’t be arsed to have 1/4 of a packet of pecans hanging around my cupboards for months. Also, I’m super into knifes these days. Considering I spend about 90% of my life chopping (well it feels like that sometimes), spending a bit of cash on a knife is a real luxury. I’m not spending £100 on one of those Japanese ones but really like my new Raymond Blanc ones if you fancy copying me. Mix it all together and you have this – delicious cake batter, which is nearly as tasty as the cake itself! Prep three tins, and by this I mean put a thin layer of butter on them. I rip off a bit of the butter packet and use that – but using your fingers works too. Now, I did buy parchment paper to show off on here, but I couldn’t be bothered. It’s a lot of measuring and cutting and it delays the cake entering my mouth. Spoon the mixture equally into the three tines and place in a pre-warmed oven (170 degrees) for 20-25 mins. Once done, take them out and let them cool slightly before removing them from the tins and putting them on a rack to cool. Look at those bad boys! Professional eh? Now lets talk wire racks. For years I didn’t bother and just balanced the cakes on any old things, but it’s a life changer. The cakes cool down really quickly and they are pretty cheap. I spotted this three tier one for £6.50 at Amazon. 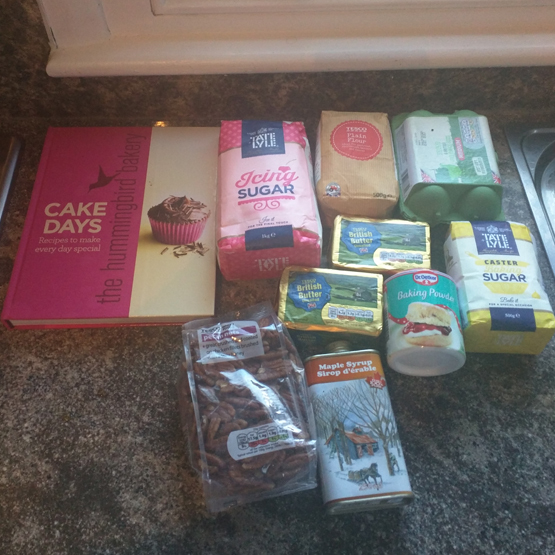 So while the cakes are cooling mix together the icing sugar and butter. Mix and mix until it gets light and fluffy(ish) and less like sweet butter. Then add the maple syrup (I go to town here). Spread the icing in-between the three cakes, while making sure you have left enough to cover the cake completely. There’s more than enough to go around. Decorate with pecans and tuck in!